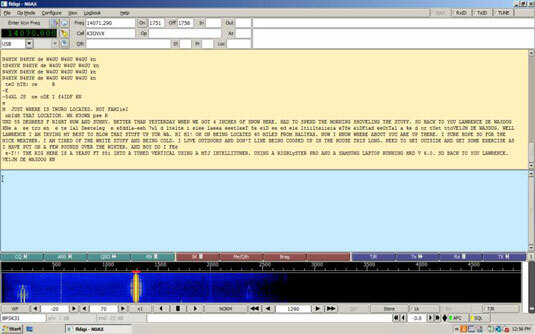 Many types of digital signals exist for ham radio, and all of them sound a little different on the air, from buzzing (PSK31) to two-tone chatter (RTTY) to a sound like a rambling calliope (MFSK). Each type of signal requires a different technique to tune in. An easy-to-use mode that you’re likely to try right away is PSK31. First, you need to be running some digital-mode decoding software. By far the most popular program in 2013 is FLDIGI, by W1HKJ. You can download it for free at Fldigi / Flarq and start using it immediately, as described in the software’s help file. If you start using the digital modes regularly, you’ll want to use an audio interface gadget between the radio and your PC. But to give the mode a try, here’s a way to listen to a digital mode signal: Just use the computer’s microphone and turn up the radio’s volume. Set your rig to USB, and tune to one of the PSK31 calling frequencies. You might try a frequency such as 14.070 MHz during the day or 7.035 MHz at night. If several filters are available, select one that’s suitable for voice, such as the standard 2.4 kHz filter. If PSK31 signals are present, you’ll hear whistling or buzzing. If you hear a hiss or static, try a different band. Run FLDIGI, and set it to receive PSK31. Turn on the waterfall display. This display shows the signal as a yellow stripe against a blue-and-black background. Adjust the receive volume until the background is mostly covered with blue speckles. Assuming that signals are present, you’ll see them as yellow stripes slowly making their way down the page. The red PSK31 channel markers straddle the signal, and if it’s a PSK31 signal, the decoded text is displayed in the yellow window. That’s really all there is to it: Run the software, connect the audio, and click a signal to start receiving. Practice this technique to receive other PSK31 signals. You may be surprised by what you can hear, because PSK31 is a very efficient mode. When you get good at PSK31, try tuning around the RTTY or MFSK calling frequencies, and see whether you can tune in a few of them.